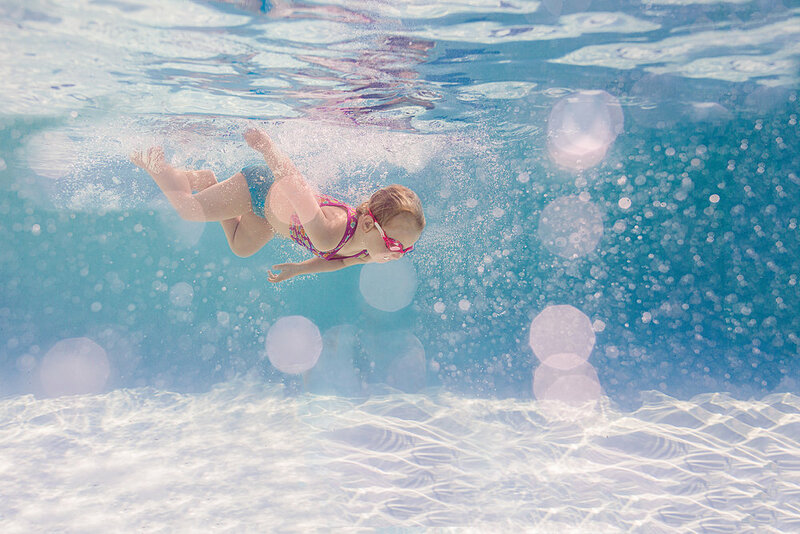 I’ve always loved being in the water and around the water, so when my oldest daughter took to it at a young age I was ecstatic. I knew right away that I wanted to get into underwater photography, but it was really quite intimidating at the beginning. First there is the choice of what equipment to use. For me, it was my DLSR, a 5d Mark iii, and it was going to be an expensive mistake if things went wrong. Then, after taking a few shots I knew the editing would present some challenges. To take a few steps back, there are so many choices in regards to equipment when shooting underwater - Go Pro, underwater cameras, submersible bags, and also housings. My first summer I bought a bag to use for my DLSR (by EWA marine), and this summer I upgraded to a housing. I know many friends that also swear by their go pros....so don’t let the equipment get you down, it’s like any other aspect of photography and it’s not the gear that matters. As for the first time you submerge, when I use my DLSR I always take a few test dips with my gear before fully going under, and I do insure my gear just in case. bokeh, and sun rays. 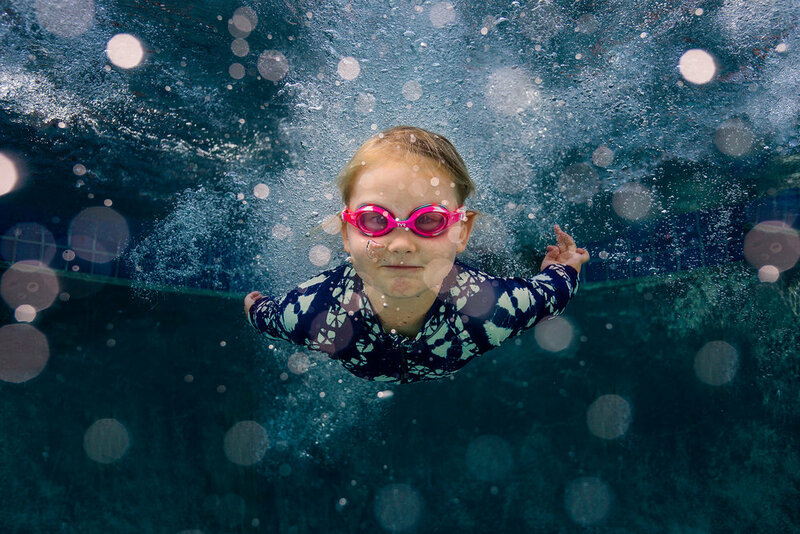 I find it pretty easy to follow my daughter around in the pool and capture whatever she is doing underwater and it almost always involves her jumping in or swimming, and not only does it make for a great image but we’re both having so much fun together that it’s a win-win for everyone. It’s been fun also capturing her in her element, last year just trying to breathe as she made it across the pool and this year as she has a love for diving to the bottom. As for the bokeh, when I’m underwater I blow air out and I’ve noticed that when I do that and the sun is hitting the water (usually backlit), I get that amazing bokeh that I love. And for sun rays, if you observe the sun in the pool and how it’s hitting underwater you will surely find them! It takes some time to study it and know when it will be just right, similar to any lighting situation, but it is worth it. I edit my underwater images in two steps, making adjustments first in Lightroom and then making my final adjustments in photoshop. And for me, getting stronger in photoshop was an absolute game changer for underwater edits, because as you know the skin tones can be a challenge when shooting underwater. I also always shoot in RAW so I have the ability to make the necessary changes in post to enhance the image. In Lightroom I will first bring the temp and tint way up (temp ~ 9k, tint ~80). I then up the contrast to at least +40/50, and the clarity to +60. This is just a starting point for me, but I do typically adjust in those directions as I get started. I also treat each image individually as I edit, especially given that I shoot in various pools as I don’t have my own in my backyard. adjustments where i need to brighten things up. I sometimes will make several adjustments, just working on a section of an arm or a leg to get it to match the skin tones on the rest of the body. I will often use the hue/saturation or selective color with a mask to adjust just the colors of the pool to meet my vision. Then I often add a levels layer to add additional contrast as well. I also will sometimes add canvas space to my image or copy and overlay a piece of the image to hide distractions where necessary (such as my husband or my other kiddos if they don’t fit in the frame). I almost always do cleanup work to remove lights, drains, debris, that I don’t want to distract in my image. Creating underwater images is definitely a labor of love for me! Although I have grown stronger with some practice, depending on the image it can take me an hour to edit a single image. So don’t be discouraged the first time you see those back of the camera photos. 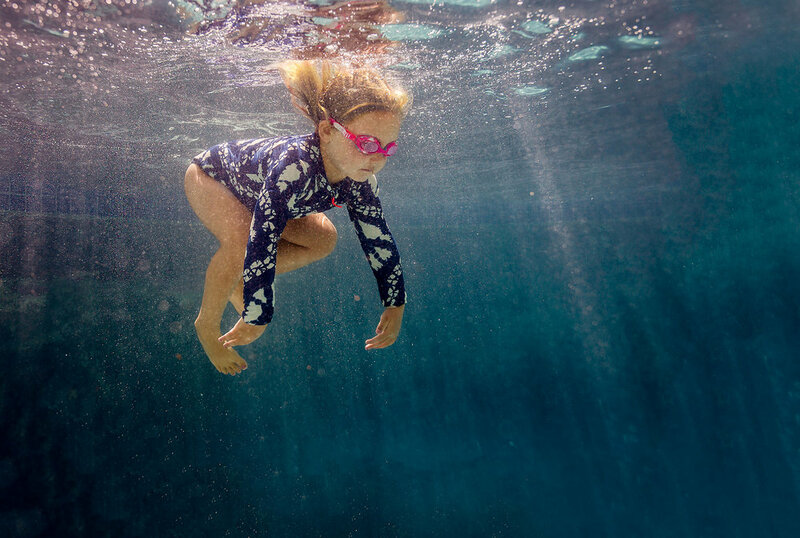 Shooting underwater is such a fun experience, enabling us to capture organic childhood moments of pure joy and also provides an awesome opportunity for growth and honing in on some editing skills.